For the most part, my childhood in Catholic parochial schools was a nightmare. I was a shy, artistic, and introverted kid. I was woefully uncoordinated and completely disinterested in the typical games other boys would play during recess. And I was bullied mercilessly. 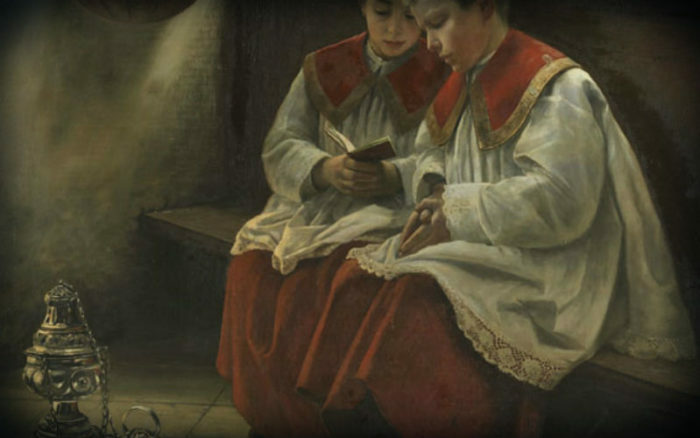 Lost and adrift, I finally found the male camaraderie I needed in my fellow altar boys – until, that is, it was taken away by the inclusion of women. It was many wounded years before I finally found my way back. This is my story…. I am a 33-year old woman and Extraordinary Minister of Holy Communion in our parish, so I’m part of the author’s issue here. Our parish needs all the lay ministers it can get for now. As long as my serving the Eucharist is in line with Church teaching, I will continue to do it. However, I greatly respect, and would defer to, the all-male clergy and altar servers if there were enough men in our parish to support it. I have heard the argument that, because women step in to fill the role, the boys/men don’t feel it necessary to do so. Interesting stance the author of the original piece takes, but I think I will continue assisting as I can in the Mass – I struggle to think because I am a woman, my service in the Mass is not required or desired. So, when my season of life allows me to do so (meaning, I don’t have little-littles in the pew with me), I fully intend to become an EMHC again, and most likely a Lector.